What’s the best way to maintain winter wellness? Curb the effects of dry winter air, of course. Dry winter air can have a profound affect on your family’s health. Achieving proper humidity levels in your home should help prevent irritating winter conditions such as influenza, bronchitis, sinusitis, asthma and dry skin. 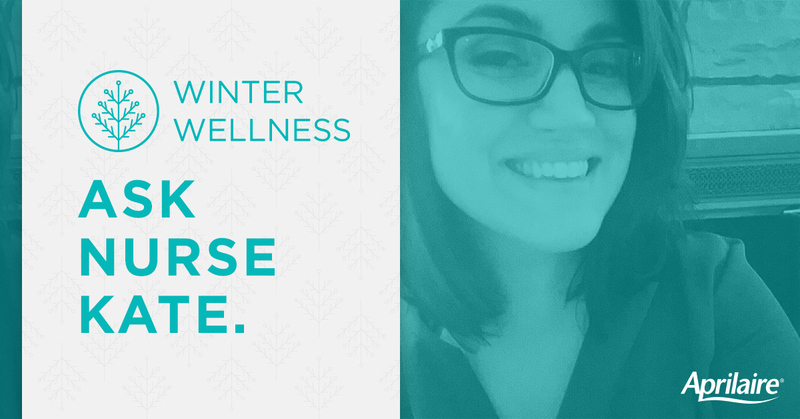 To drive this home, we asked our resident health expert, Nurse Kate, to answer some key questions that should help you and your family understand and maintain wellness this winter. Question One: Does the flu virus really thrive in low humidity? How so? Good question! Research has shown that the influenza virus thrives in cold, dry air typical to our winter season1. The likely reason for this relates back to how the virus is transmitted from person to person. Influenza spreads through tiny respiratory droplets that stay suspended in the air after someone coughs or sneezes. Low humidity allows these droplets to stay in the air longer, which in turn increases the likelihood of transmission1. Question Two: What about dry winter air causes people’s sinuses to act up? Low humidity is a trademark of winter air, which can lead to irritated sinuses. Our nasal passages need a certain level of moisture to fend off the nasty bacteria, viruses, and allergens that cause our sinuses to act up. Because winter air is so dry, it often robs our sinuses of needed moisture, leaving our nasal passages dry, irritated and less able to fight off wintertime illness. Question Three: Does dry winter air affect children and adults differently? How so? Dry winter air can be problematic for children and adults alike. However, kids can be more susceptible to wintertime colds and illnesses due to increased exposure and an immune system that is still developing. As noted above, proper humidification can be key in stopping the spread of illness and helping you and your little ones stay healthy all winter long. Question Four: How can we protect ourselves from dry winter air at home? Staying hydrated inside and out! Drinking plenty of water helps our bodies maintain hydration from the inside. Combating dry air through home humidification helps our bodies stay hydrated from the outside. Various methods of increasing humidification in your home include taking hot showers with the door cracked to let the steam circulate, utilizing a portable humidifier in the most used rooms of your home, and installing a whole home humidification system. Question Five: What about when we’re not home? Do you have any tips for maintaining winter wellness at work or in the car? Washing your hands with warm, soapy water for at least 20 seconds can prevent the spread of so many illnesses. The CDC has a great website for more information on the do’s and dont’s of proper hand washing. Limit sharing of food, drink and other items. Germs do a great job of getting around, so limit your exposure to them by keeping your food, drink and other items to yourself as much as possible this winter. Eat well, sleep soundly, and don’t forget to exercise. Your body needs to be taken care of so it can properly take care of you! Make sure to give it all it needs this winter by eating nutritious food, getting a good night’s rest, and staying physically active. Getting 8-10 cups of water in per day makes such a difference in keeping your body healthy and well, particularly during the dry winter months. If you find that you are having a hard time drinking water throughout the day, try bringing a refillable water bottle with you wherever you go. Adding in healthy options to your water such as mint, lemon or cucumber not only makes your water taste more interesting, but adds a nutritional boost to your beverage as well! Ideally, you should aim for 30-50% humidity in your home year-round. In the wintertime, a trusted humidifier can help you prevent these winter conditions and help you hydrate your home. Find out how easy it is to maintain winter wellness in your home. Contact a dealer today!